Samsung may be preparing to launch a new wearable alongside the Galaxy Note 8 phablet later this month. A new FCC listing for a Samsung wearable was found by The Leaker and shows early diagrams of what the new wearable could look like alongside the name Samsung Gear Sport. It may be this is a new fitness focused version of the Gear S3 we've expected to see for quite some time since the original S3 watches debuted at IFA 2016. Other new features on this new version of the Gear watch are currently unclear though, but with the name sport we expect it to pack some extra fitness focused tools. The diagram of the Samsung Gear Sport listed on the FCC.gov website. Credit: FCC.gov. Via: The Leaker. 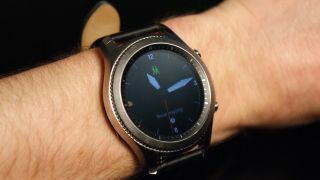 The diagram shows a similar design to the original Gear S3 Frontier and Classic models. Samsung has a big event scheduled for the Galaxy Note 8 launch on August 23, so this may be an extra announcement we get to see at that launch event. If not, this new version of the Gear watch may be announced at IFA 2017 which is kicking off on August 30, a whole year after the launch of the original Gear S3 watches. Rumors of the Samsung Gear S4 are also growing at the moment but this leak doesn't seem to be a whole new revamp of the wearable line that's anticipated for the Gear S4.